Our proposal for a Linda Farrow eye-where pop-up store is a dense environment of objects, surfaces and products. Given that the site is a shipping container on a Manhattan pier, our proposal references the world of commerce and culture; it imagines opening up the container after its journey from an unknown origin and finding the eclectic residue of another place and time. 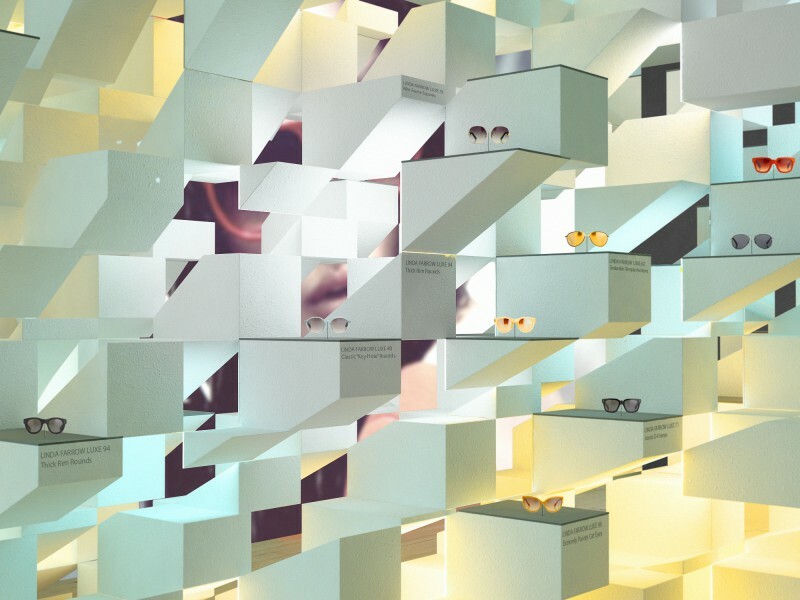 The space of the store is hollowed out from this trove of objects, held in suspended animation. 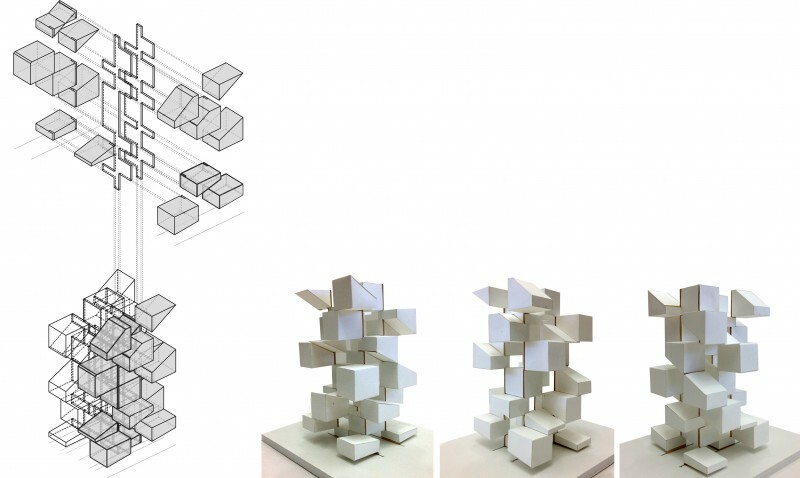 The proposal also stems from our ongoing research using computation to design complex forms and aggregations. The stacked boxes appear jumbled, suspended in midair and barely resting on each other. They frame a constantly changing set of views, reflections, lights and shadows, choreographing a playful visual dance through the stack that engages with the Linda Farrow brand. 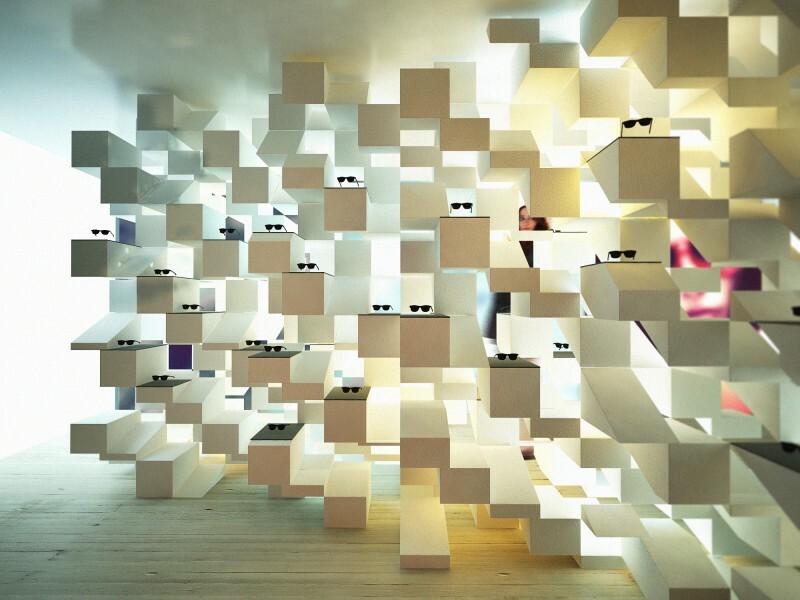 Glasses, displayed in a set of variable niches, are presented individually even as their reflections, and those of visiting customers, bounce through the stack. The project is made by combining the precision of CNC cutting with commonly available materials. Three pound EPS foam is wire cut and strapped to vertical fins that span from floor to ceiling. This Foam is far more dense and durable than standard one pound packing foam, yet can be cut with a CNC wire cutter into crisp shapes with sharp edges. At key points of contact and display, the foam blocks are surfaced with mirrored and acrylic surfaces, preventing damage over the course of the store’s life. This stack acts as infrastructure for the display of Linda Farrow glasses, presenting each pair on a clean acrylic surface and hosting a series of battery-powered color LED lights and vertical mirrored surfaces within the stack. 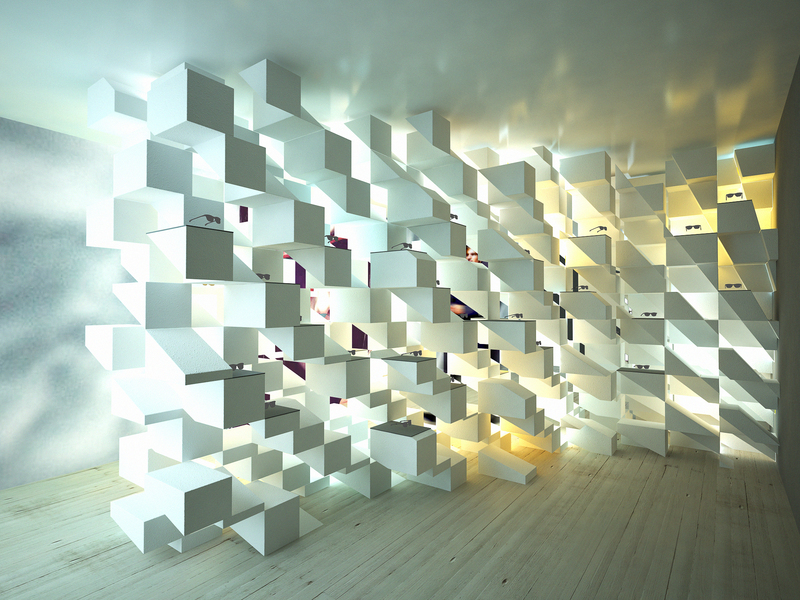 The LED lights infuse the white stack with a array of colors that might change over the two month life of the store.